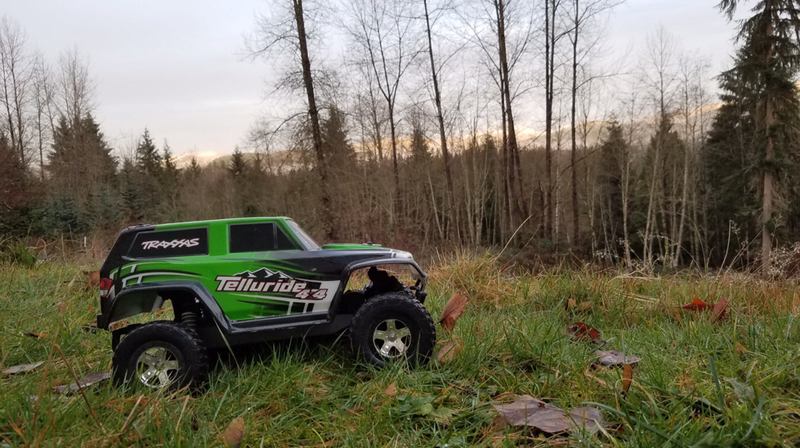 Building a custom Telluride has been on my to-do list for the past two years, but life and other things have consistently gotten in the way. 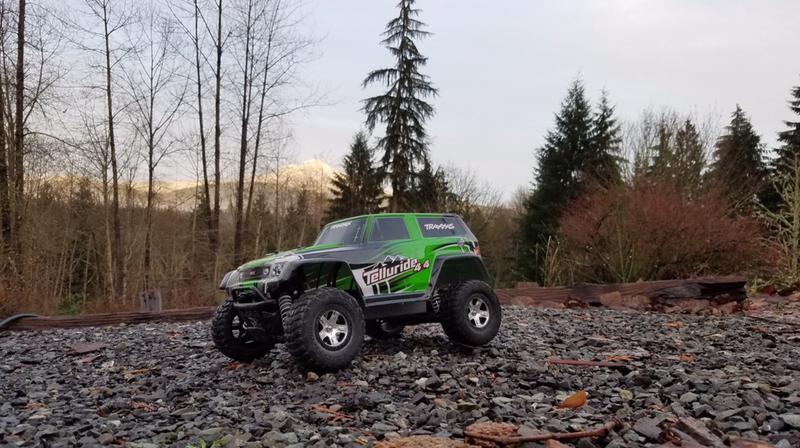 Recently, Traxxas posted up on FB about a limited-release Stampede 4x4 XL-5, which piqued my interest, and I came close to having my wife stop by a lhs to pick up the only one they had in stock, but decided to sleep on it. Giving it further thought, however, only served to remind me that a brushed Telluride was still more appealing. The following morning, I hopped on eBay and what did I find? A good “Buy It Now” deal on a lightly used, all-stock, green Telluride! You see, I recently moved my family into a new home, and nearly my entire RC collection is packed up in a storage unit, so I won’t be building anything anytime soon. Thus, I couldn’t pass up the opportunity to get a Telly to run around at my new place, in the here and now. The truck came on Thursday, while our power was out due to a windstorm, so I didn’t even pull it out until Friday afternoon when I got home from work, and even then I only had about fifteen minutes to look it over, put in a low-charge lipo and run it around in the driveway, because I had to get back in the car and drive my daughter into town. The immediate problem, now, is that I can’t remember where I packed my charger, so I can charge my batteries! Too bad it's discontinued - it is a great platform for a beginner (or for the rest of us to modify). I built one from scratch and was able to get that exact body just before it was discontinued. I have it pretty much for slowish trail running, with a Holmes Hobbies Trailmaster Sport 550 21T motor and the HW Quickrun 1080 ESC. It's technically specked as a Stampede 4x4 VXL (and then some...), and I absolutely love it! I found the 30wt shock oil to be way too thick - it was bouncing all over the place. I now use 15wt, and it looks a lot more scale. Thanks. I was planning to do a scratch build, also, and still have all the parts, but I think I'm going to pass on that, and sell both the project parts and this RTR. I found myself just wanting to run the Telluride fast, like a Stampede, which I already have. I really have too many scale trucks, already, including two TRX-4's (one not yet built). Or, I might just sell all the parts to build the custom one, and keep the hop-ups I had, and use those on this RTR. Maybe it'll be more fun once I slow it down with the brushed P4de diff gears, I don't know.